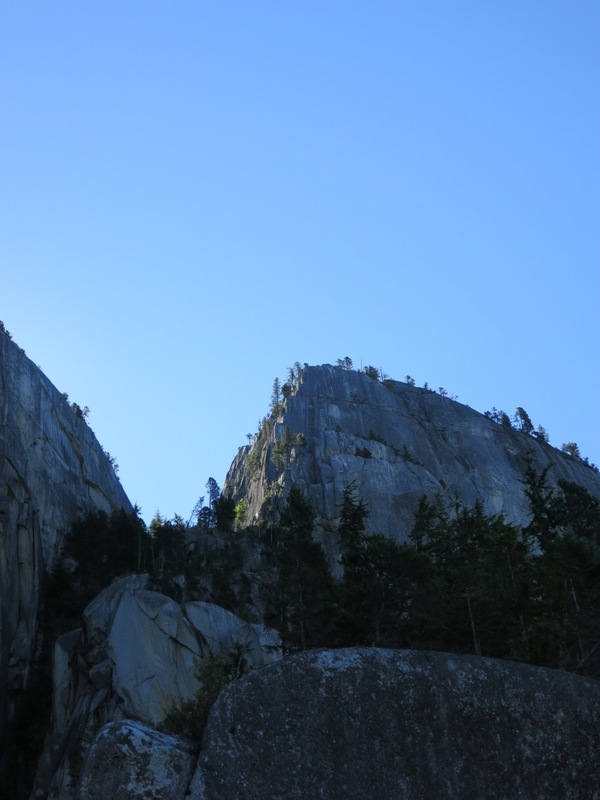 One of my favorite writer/climbers uses this term to describe “the state of being in between.” For me, liminal describes the delicate line that exists between having fun and pushing myself through fear, or pain, or stress to have deeply transformative experiences. Liminal is the feeling of walking the perfect, terrifying line between hanging on and falling off- and it’s really surprisingly fun. 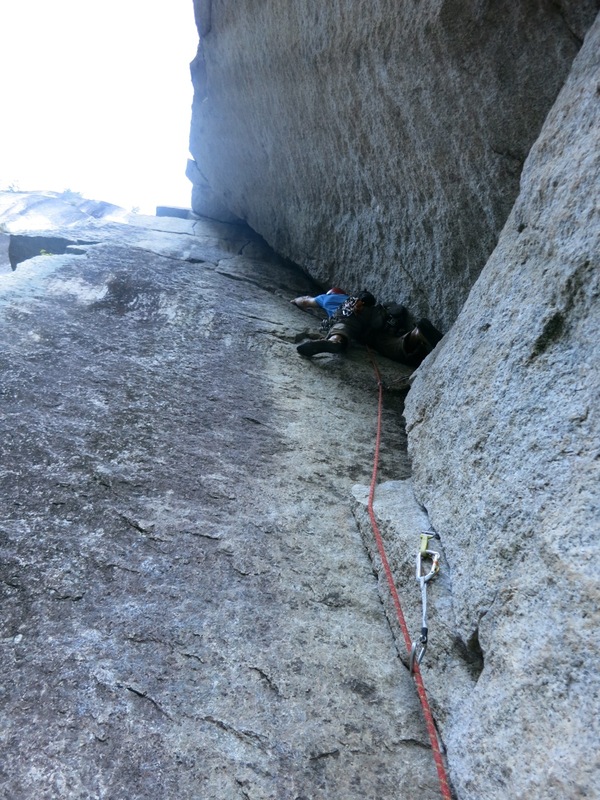 I wasn’t feeling like climbing that hard in Squamish. I just couldn’t seem to find the extra mental fortitude to get on climbs with harder numbers on them. This blog started with a mantra “Let go of the baggage, and get the feeling to stick,” but I’ve been carrying some baggage for most of this summer. Before we left Washington, Dustin ran me into the ground before dinner one night, but we couldn’t leave it behind. Long days of driving, and time with some of the most amazing people in my life hasn’t been able to lift it. I won’t make excuses, I need to make some corrections, but pretending it isn’t there doesn’t serve anything. Climbing though has it’s own way of stripping it all away like nothing else can. 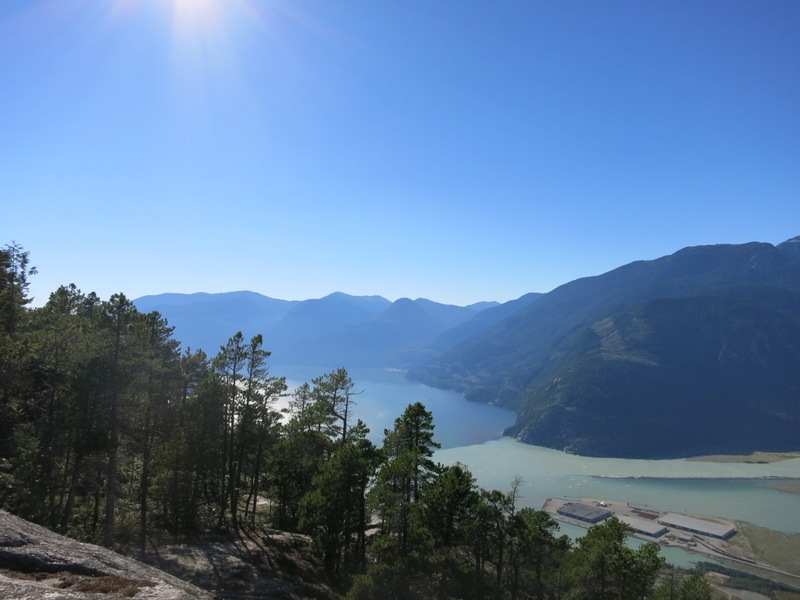 I knew I wouldn’t feel right if I left Squamish without walking the liminal line. First glance at the Buttress. 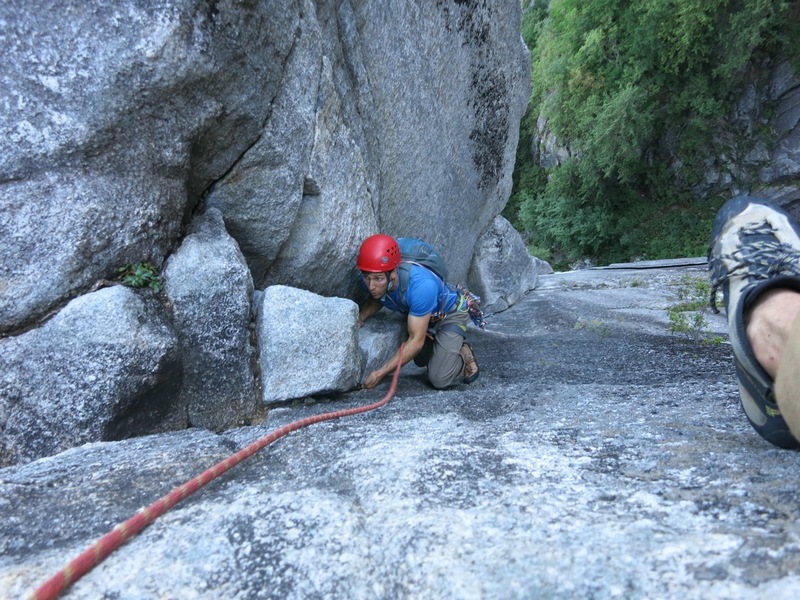 I spent 10 days in Squamish in 2010 and loved every minute of it, but at the end of a long day that June, I stood at the base of the crux pitch of “Squamish Buttress” (5.10c, 5 pitches) and handed over the lead to my friend Hans- only because I was scared to walk the line. This year, Ky drove up from Bellingham after work on Friday just as Dustin and Gaio had to head south again. We grabbed a few warm up pitches, and planned an epic Saturday. Mr. Nayfield leads us up the start. The Buttress is one of the last pitches on the way to the summit, so getting there means picking one of several other excellent routes to combine into a full day of climbing. 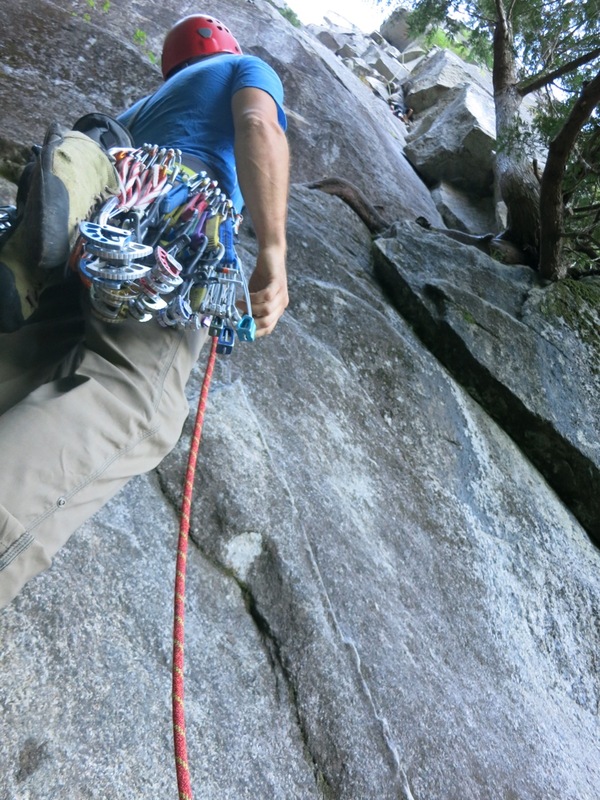 One of the most vertical and direct preliminary routes is “Rock On” (5.10a, 5 pitches). All of the pitches are dead vertical, and the 50m pitch 4 crux features an exciting overhang on amazing jams. 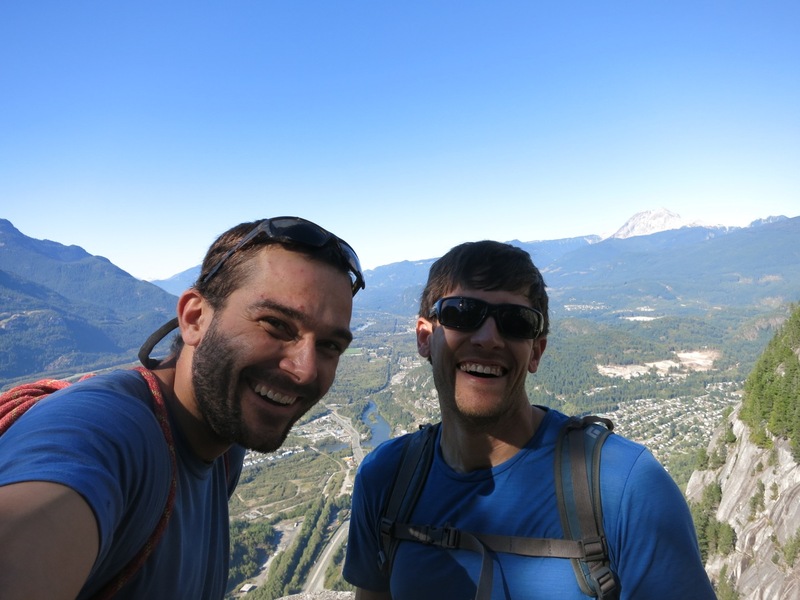 Frequently included as a top 100 route in Squamish, we had a very good time. Working the pitch 4 crux. Rad overhanging corners on the lower route. There is a magical thing in climbing, when you and your partner simply “click”. It’s kinda always felt that way with Ky, and the pitches flowed by, each more fun than the next. From the top of Rock On, we hiked through the trees and found the alternate 5.9 slab+arete start to the Buttress route. Ky led brilliantly while my butterflies started to flutter as we worked our way up to the crux. Me, getting into the business (photo: Ky Nayfield). We took a minute at the base. No one else was in line at the crux, and I needed to clear my head before I got down to business. 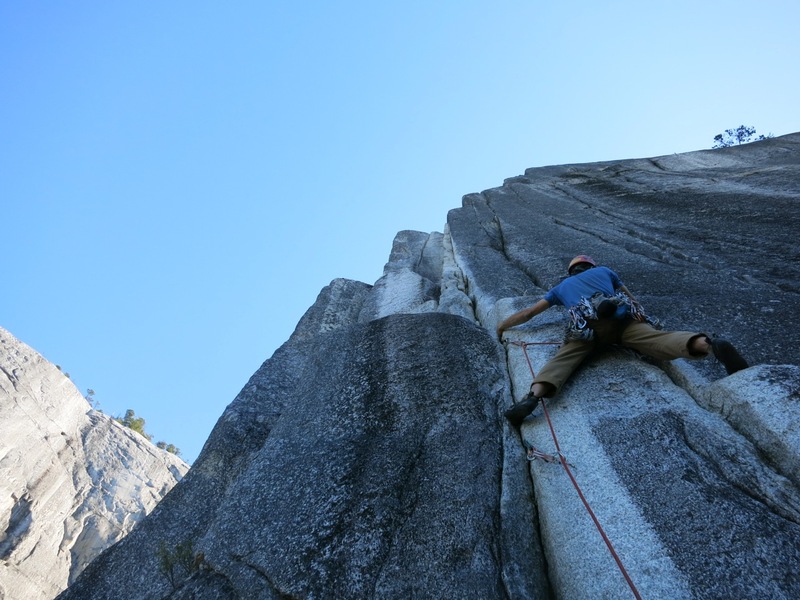 The climbing is thin, cerebral, and sustained- you can’t just muscle it. I tightened my shoes and headed up. It’s hard from the get go, and just gets harder. Once I committed to the second half of the route, I was in it to win. I took my time thinking through each move and each piece of protection. When you are right on the line between falling off and flowing onwards, there is nothing else to think about. It is one of the most perfect feelings in life. Blue shirts, red helmets, and tan pants, I swear we didn’t plan it that way. I did send the route cleanly, and was more than happy to put the old fears away. Ky and I made it back to Bellingham in ample time for dinner and rest before my long drive to Montana the next day. No doubt one of my best days climbing with one of my favorite partners on a perfect link-up of terrain. The clarity and stoke stuck in my system for days. It only happens when you are willing to step in the arena and try- when you walk the liminal line. Pick something hard and chase it- it’s worth it. This entry was posted in Uncategorized on September 20, 2014 by sticker1.